This is Private Hannah Foraker from Cleveland, Ohio. The 21-year-old went off to basic training in Oklahoma in September, before transferring to Houston upon her graduation in November. Her time was made harder because she was separated from her beloved animals, including her horse, Derby, and her 13-year-old golden retriever, Buddy. So, when Foraker returned home for two weeks over the holidays, the reunion between her and Buddy was incredibly emotional. “She was completely overwhelmed and she couldn’t even stand up,” Foraker said. 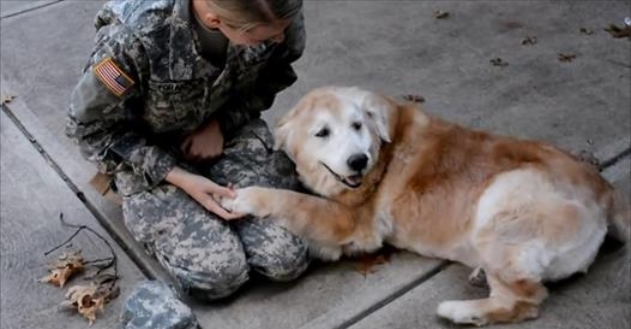 Responses to "This Elderly Dog Cried When She Welcomed Her Best Friend Home From The Army"
Beautiful, and "welcome home". Thank you for your service.